Bartender Question: How do I Cut a Customer Off? In the bartending industry, certified bartenders may find themselves facing rowdy customers who have had a little too much to drink. Knowing the signs of over-intoxication, and when to say no are part of responsible server training. America’s Alcohol Certified Education Association asked bartending pro Jeffrey Morgenthaler how to cut someone off - on the subject, he says, "Telling someone “No more” can lead to an uncomfortable situation. So that’s why I now try to approach the denial of alcohol from a hospitality-centric perspective: I’m the one who helped get you into this mess, and now I’m going to be the one who helps you get out of it – a bartender in every sense of the word." Some of the best methods for cutting unruly customers fall into the category of simply caring for your customer. You want them to continue to come back for a long time to come, which means that in no condition should they get in their car while inebriated. Jeffrey suggests simply explaining this to them - and then by suggesting food, soft drinks, water or coffee to over-inebriated guests, you keep them in a safe place, while giving them a little bit more time to sober up. The next step after diffusing the situation is to alert the rest of your crew, so that nobody continues to over-serve your guest. Bartenders who seem caring, who de-escalate the situation, and who offer to help clients seem to have the best results when cutting off customers. "When I probably have had too much, bartenders often take far longer to come back to ask for my next drink than they usually do, or they forget the drinks I’ve ordered, or introduce me to someone who’s about to go have a cigarette. I appreciate these measures that let me save face (and sometimes not even notice that it’s happening), while having the same effect of keeping me from having far too much more to drink." "I had to come up with something creative. It’s my bartender nature to always bring humor into as much of life as possible, so I went out and bought an Operation game. I used the game for guests I felt should be cut-off. I’d pull it out with a big smile and tell the drunken soul that I would strike a deal with them. The rules were simple. Get all the bones out without the red buzzer nose going off and I’d serve them another drink. The game on the bartop was a magnet of fun and as you might have guessed, a big hit. The people that loved it the best were the local cops. They called it my sobriety test." By keeping your cool and being discrete about cutting someone off, you encourage your customers to continue returning to your establishment. Not only that - you diffuse potentially unsafe situations. 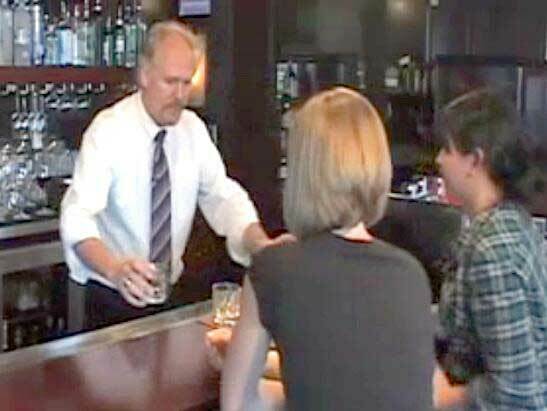 AACEA's certified bartenders gain valuable experience like cutting off inebriated customers at our mandatory alcohol server training classes. We provide online alcohol server training, while promoting responsible service and sales of alcohol. To get your servers permit, visit www.aacea.com.